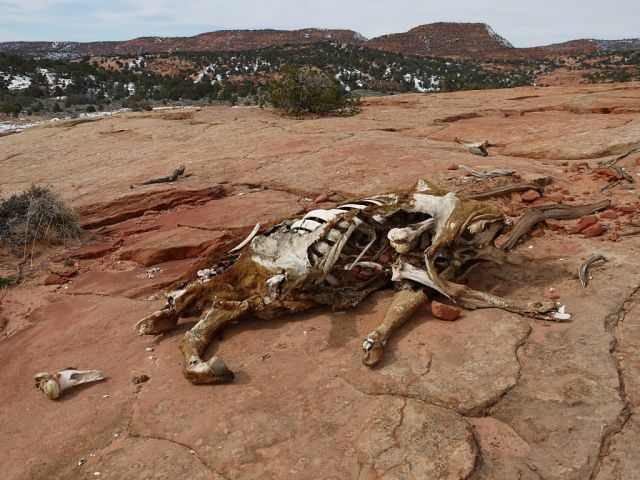 Navajo people in an Arizona community where livestock carcasses are laying around are desperately needing water not tainted by uranium, an official said this week. Navajo Chapter grazing official in Teec No Pos Herman Lee told the Navajo Post in an exclusive telephone interview this week that his community desperately needs water. The right to water is a human right. The uranium industry violating that right is threatening lives of Navajos at Teec No Pos. “The uranium is pretty much in the water now a-days,”Lee said. “That’s what we’re going to be pumping: uranium mixed with water. It’s pretty high you know. The community of Teec Nos Pos was placed under a drought warning earlier this month. According to Council Delegate Kenneth Maryboy, local water wells were closed due to water contamination, essentially triggering a water shortage. “We try not let this get out too far out of hand. We have plenty of carcasses out there now. Lee said that he did not want this to become a health issue, but bacteria could become air borne and families are using the same water. “Once that bacteria and everything else 9from the0 carcasses go air borne, we got a health issue,” he said. Lee said that documentation of who tested the water cannot be found. Teec Nos Pos Chapter President Alfred Jim, said earlier that they are still waiting on the Navajo Nation, San Juan County, and other agencies to respond, but that so far they are dissatisfied with the reaction time from leaders. Can you help? Teec Nos Pos Chapter telephone number is (928) 656-3662.